We are qualified Solicitors and members of The Law Society and are Regulated by the Solicitors Regulation Authority. Matthew Wilkinson Solicitors Limited is a body Recognised by and Regulated by the Solicitors Regulation Authority. This means that you will always know that your matter is being handled by properly qualified and regulated Solicitors and that the firm is properly supervised and managed in accordance with the requirements of the Solicitors Regulation Authority. In accordance with normal industry standards and in compliance with our Regulatory Code we carry approved Professional Indemnity Insurance in respect of all of our professional services. As a firm we recognise the need to promote the highest standards of Practice Management and following a vigorous assessment procedure we are pleased to confirm that we have been accredited with The Law Society’s Lexcel Practice Management Standard. The obtaining by Matthew Wilkinson of the prestigious Lexcel standard is proof that when you instruct us your case will be handled with a high level of service. The award is re-assessed on an annual basis, which means that we are continually seeking to maintain and improve our standards and that when you instruct us you know that we have passed an independent assessment by Lexcel. The audit is carried out to ensure that our service standards, the way we work for you and the Management of the firm all meet the highest standards required by Lexcel. Maintaining high practice standards enables us to provide our legal services to you in the best way possible. 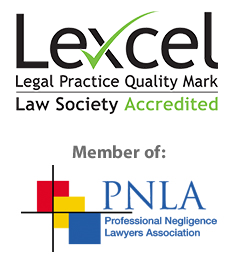 The Lexcel accreditation is only awarded to law practices, which have achieved and can maintain these high standards. The award of the Lexcel standard to Matthew Wilkinson will help you receive an excellent and efficient professional legal service by a well- managed firm. Our Mr Matthew Wilkinson is a member of the Professional Negligence Lawyers Association, which is an association of Lawyers specialising in Professional Negligence cases. The Association provides training and discussion opportunities and promotes awareness and reform on Professional Negligence issues. Mr Matthew Wilkinson contributed to an article on Professional Negligence in the Corporate INTL Magazine in December 2010.